Microsoft is doing a pretty good job of explaining Windows 8 and everything that's new about the OS to developers and its post on Metro tiles is no exception. The use of Metro tiles in Windows 8 is all about aligning the desktop OS with its mobile counterpart. 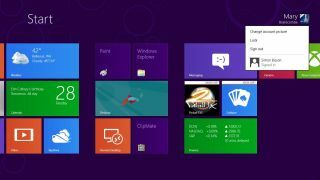 The tiles do make more sense on a mobile device, but Microsoft has released more information on how they can be used by developers to better consumers' experience of Windows 8. The post on its official blog is rather technical and features a number of instances of code, but it does give a decent impression of what is to come with Metro tiles. "When users see fun and interesting things on their tiles, they will be more likely to launch your app to learn more about it," explained the post. "There are four ways that an app can update its tile. Apps can use local notifications to update their tile, which is useful if info changes while the app is running. "Apps can schedule tile and toast updates to happen at precise times. Also, apps can use push or polling tile notifications to update their tiles from the cloud while they are not running." Microsoft offers up some code for a Metro tile that's centre around a food truck, where a user can pin the tile to the taskbar and track its movements – once pinned this becomes a secondary tile and real-time notifications will be sent to it. Microsoft recently announced that there will be just three versions of Windows 8 available – couple this with what seems to be quite a simplified tile system and the OS is shaping up to be the company's least complicated software yet. Hopefully this means Mr Clippy's cousin, Mr Tiley, won't pop up asking if we need any help.